To stand alone is hard, real hard. It’s tough to go against the grain and be different. There is comfort and safety in numbers. No one wants to be stared at, looked down upon, laughed at or left out. No one wants to be the crazy, different person. For many women who are convinced head covering is for today, taking the leap to practice it alone is often the scariest part. “If only there were others” is their cry. 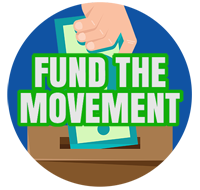 I remember watching a TED talk a few years back about how a movement is started. The speaker played a video of a young man dancing outside by himself. All around him people were relaxing and enjoying the sun and this guy was making a fool of himself by dancing wildly alone. This lone dancer, the speaker pointed out, is a leader. Shortly after, one other guy joins him in dancing and they “brave ridicule” together. Then another joins them, and another. Soon there’s a whole crowd of people dancing like fools together and the speaker points out “as more people jump in, it’s no longer risky”. He continues, “they won’t stand out, they won’t be ridiculed”. The crowd felt comfortable because there was so many other people doing it too. They were the majority. However, that wouldn’t have been the case without the first brave guy. Someone needed to stand up and start and when that person does so, they makes it easier for others to follow. 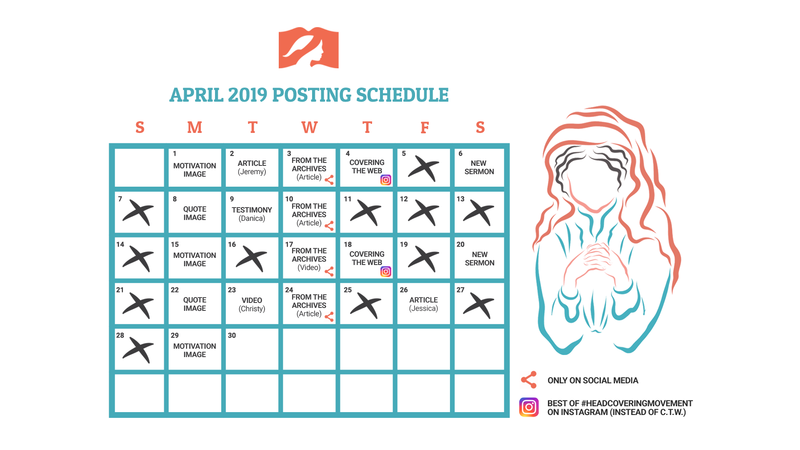 As I hear testimonies of why women both start and stop covering, it’s often connected to what other people are doing at their church. 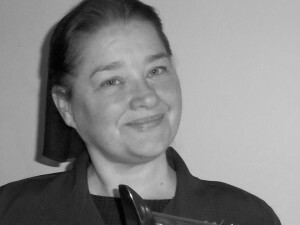 Desiree Hausam in her testimony shared that what led her to start covering was the fact that a friend of her’s “began to wear a hat in worship”. This led Desiree to re-study the topic with her husband and once convinced they began to practice it too. 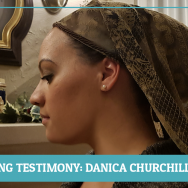 Similarly, Danica Churchill mentioned in her testimony that “a family began attending our church who came in wearing headcoverings when no one else was practicing it”. That family had to stand alone but it inspired Danica and her husband to search the Scriptures for themselves. Now not only do the Churchill’s practice it, but so do many others in their church including their pastor and his wife. This is not to say disobedience to this command is justified because of fear, but I want to be sympathetic. How great would it would have been if she didn’t have to stand alone? One person setting the example will by their action encourage others to follow. The person who stands alone is not only a leader, but a servant. They serve their fellow sisters by doing a hard thing for them. They bear the ridicule (whether perceived or real) and determine that they will be the one seen as “odd” so their fellow sisters don’t have to. They by their obedience make it easier for other women to follow. Not only that but as Desiree and Danica can attest to, they will cause other people to search the Scriptures for themselves to determine if head covering is true. So I’m asking, will you stand alone? Will you serve your sisters by being the first (or first few) in your church who will cover? If you will, you may find yourself like the lone dancer did, with a crowd around you following your lead. When I was first convicted, we met with an assembly of Plymouth Brethren, so all the ladies covered (except me, for over a year after meeting with them). But none of the other people in my life understood, and some thought we had joined some cult or something. (my parents included) I didn’t cover full time. I went to a Baptist ladies convention with a dear friend in that first year, and pulled out my covering for all the meetings and put it on. It was challenging, and I was so tempted to *not do it. But my dear friend knew I covered, even though nobody else there knew me, I had to be consistent with what I had told her I understood. She was also 10 years older than me, and more studied in Scripture I’m sure. She saw the covering as the hair, and we discussed it many times over the years, but I could never reconcile that interpretation. Now, I cover almost full time, as my understanding is that the passage doesn’t limit to public prayer only. I am the only person in my home schooling community that covers. I have been asked about it a few times, but most won’t broach the subject. I felt very conspicuous at first when meeting with new groups of people, but I don’t even think about it now. what a sweet testimony Kay! It can be very hard being the only one and being judged by other Christians as being legalistic.But we have to remember who we are doing it for and then it makes it all worthwhile:) Praise be to the Lord. Don’t you love the “legalistic” card? It’s an easy one to use. In the strictest sense, it’s about applying the law for salvation. In a more general sense, it’s used to determine one’s relationship with God. Some are taught it without knowing it. Like about giving money. “Must give at least a tenth or you are robbing God.” Or, If you are a “Christian” you will/would/won’t do A-B-C. (not drink, keep the Sabbath, dress a certain way, etc.) Little is understood it seems about simply teaching the Word, as understood, and allowing the Spirit to lead those who would into obedience. In our culture, covering is most common in groups of Christians that are known to be “legal.” Groups that often don’t adhere to eternal security, and see teaching Christian liberty as a means to allow sin to flourish. The fine line we walk, with whatever practice we take up, *or avoid, is that we do it in faith according to our own understanding. And let others do the same. Abstaining from activities, or taking up practices doesn’t make us more holy. It doesn’t please God, because He sees us all as perfect through Christ’s righteousness. If we are obedient in faith, in seeking to submit to Him, then these things conform us into His image, and the Spirit is more able to use us. But if we do it with the idea that we are garnering favor, *that is what I would call legalistic in the way others want to toss it out. It can even be tough in your own mind to rectify your own motivation for doing something. It feels good to keep rules, follow a standard, and do a good job at it. But it has nothing to do with the Lord working through you, and can even hinder your usefulness as a witness. I stand alone. even my own mother won’t cover her head. but I will cover my head during prayer and I mean anytime. I always have a covering with me! We aren’t the first – there are a few older widows and new single ladies who cover during church. But it’s definitely not something generally accepted. I am a ‘stand aloner’ at my job, in my church and among my family. 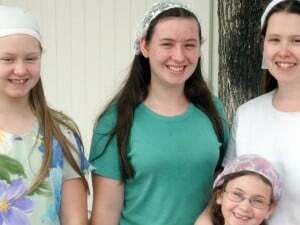 I started headcovering last February (2013). Is the covering for public worship/prayer only? And what is the meaning of “covering” or “to cover”? What is it supposed to cover? And how much? Each to decide on their own? I guess to each their own! There is so much confusion that is fueled by such discussions…. My interpretation of modesty is quite different from the person next to me….yet it is not my place to define it for them. That is a subject they need to discuss with Jesus. So it is on the subject of the covering…my/your interpretation matters nothing when Jesus is saying something else. Not very impressed with the views/confusion expressed here. Not exactly sure why you said what you did as those aren’t my views. Our article on “What kind?” specifically said we thought it was an issue of Christian liberty. Also choosing between different forms of covering (or the choice to wear no covering) makes no one more or less of a Christian. I understand your frustration. What I see as a benefit (of this site) is the teaching and study of a passage that is often ignored or sidestepped. It has no more importance than any other teaching for the assembly. Wearing a covering doesn’t make you a “better” Christian any more than gathering for worship or giving your money as the Lord leads. But if you study it, and understand it as a valid practice, your obedience in faith helps your growth as a believer. Just as obedience in any other area of your walk. It is very difficult to be the only one who covers. You stick out sooo much. I have been talked about and lost friends. No one wants to be friends with a “legalistic” weirdo. 🙁 But, I had to face my fear of man and do it anyway as I feel that I should. No one said the journey would be easy. It is nice to see women cover on the foreign mission field. It just seems to be a lost practice here in America. I´m the only one who wears a headcovering. First I started very simple, it didn´t look so good, and I didn´t feel good. Then I started again when I saw several way to wear it on youtube. Now I have found a style, that even nonchristians tell me they like it. And some christians asked me about it. I don´t tell why I do it or that we should do it, I just do it. And if s.o. asks me I say why. But to the nonchristians were I live I just said I like it. As I know it doesn´t make me holier it is not the center of my faith. But after some years of wearing I find it more and more “natural” to wear it. For many years I was in a church that did not cover and many women cut their hair. I covered and for seven years dealt with ridicule and rude comments, both from individuals and from the pulpit (comments like ‘it isnt what you wear; it’s a sign of pride that you seek to be different from everyone else; what a pity we never see your lovely curly hair; etc). We then moved to another place and now attend a church where the members cover for worship, but not the rest of the time. They are aware that I cover, but it makes no difference to them. I have been in my current church 3 years, yet no-one has followed my example, or looked at the Scriptures for themselves. They say that is isnt for today, or the hair is a covering. They dont look beyond the words themselves and so dont understand that the word for covering re the hair is a different word than the word for covering in the rest of the passage. 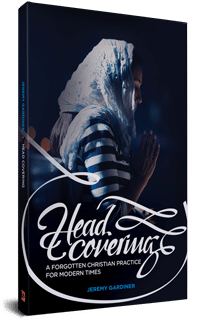 It is so hard to be different and there are times when I dispense with the covering because my church and my husband do not think it is essential to wear a covering all the time. I am so confused and dont really know how to deal with this issue at all. I am sorry you have been ridiculed. i hope you can find the will of the Lord as to how much/how often He wants you to cover. Sweet sister, don’t give in just because of other’s comments. As Christians we are to be different. Be in the world but not of it. By covering, we show the world that we cheerfully submit to our Lord. That HIS opinion is the only one that matters in our lives. I cover full time, and my choice of veiling resembles that of the middle eastern women. I’ve been leered at nastily like I’m a Muslim. I go on and let God’s love shine thru to all. I only care that I’m pleasing Jesus. I am so encouraged by all of the comments. I have been ridiculed for wearing a head covering in the workplace and told that it is not appropriate. It helps to know that there are others who keep pressing on, despite popular opinion. I am sorry people have ridiculed you. What type of workplace do yo work in? Thanks, Sara. I work in a government office. I have no face to face contact with the public. The majority of my coworkers and my boss are fine with it but I guess there will always be those who have a problem with anyone different. I hope they will change and be supportive of your choices. I am glad at least the majority and your boss are on board. I, too am sorry you have been ridiculed. You are giving testimony albeit silently, as to who your Head is. If anyone asks, explain to them the Bible verses and who our Head is. You may win converts. As far as I know I am the only person in my church who intentionally covers. When I first started cover, at the first of the year, each Sunday there would be a few people with hats. More males than females unfortunately. As we have come into the summer season I often don’t see any other ladies with hats, but a few men with ball caps. One time as the communion was being passed, the man in the seat next to me was wearing a ball cap the whole service. But as I passed the tray to his wife seated directly beside me, the man took a look directly at my hat, then then removed his hat before taking the communion. When I visit my father and take him to church, there is a lady now that I have seen wearing a hat at the last 2 times, I wonder if this is intentionally. It is hard to be the only person who covers, but I hope in time that others will follow. Don’t worry about what others think. Just do it for the Lord. After all, HE is the only one we are to please. Right? This weekend I am going to be the first. I started Tuesday covering full time. I have been convicted of it for some time but had to dig a bit deeper. Its going to be interesting since I am going camping with our youth group tonight through Sunday and church Sunday morning. I am covering in a headband like way since it is more comfortable for me. I hope to find other ways also as I get more comfortable with it. I do hope to inspire others in our church. I’ve only understood God’s Word regarding covering for 3 years. I am the only one in my town (to my knowledge) that does. I do sense that many look and wonder why, others avoid me, and just a few have called me ”legalistic”. My husband supported me – at first. Then, he told me of his wish to see my hair ”a little more often”. I stopped for over a year and only began again a few months ago when The Lord’s tug upon my heart couldn’t be ignored. Not long afterwards, I found a group on Facebook and The Lord has blessed me with fellowship therein. Sometimes, each day can present a challenge to find and employ a covering, but God gives me such joy as I obey His Word. Every one of your testimonies here have blessed and uplifted me! Reading of your trials and realizing that I’m not alone – at all, is truly wonderful. Although my husband doesn’t verbalize it. I can tell by his actions and the way he looks at me; that he loves my covering. Also, my covering and my submission to God-and not being ashamed to show it- has led my husband into a deeper relationship with God. So you see, sisters of the veil. Our voluntary submission to the Lord does not only affect us, but God works thru us to positively affect others around us. Don’t be ashamed to veil. That says ( to me anyway), that we are ashamed of submitting to God. And we are all His Brides to be very soon. This is an encouraging article, as are the comments. It’s nice to know that I’m not the only one to really wrestle with fear of man. Nothing new under the sun, I guess. I never thought about standing alone and having even the pastor make comments :(. My place is a little different…recently being convicted to cover and being the only lady AND being the pastor’s wife. Praise the Lord that my husband stands with me. And that God chooses and uses us to grow others. We cheer you up, my sister! from your fellow headcovering sister. I have been using the head covering since I began to understand it , back in 1986 . All my girls were raised with it also . Now , as an older woman , I still practice it when in prayer , and at church . We have been in many churches , but we have been Missouri Lutheran Church for over 10 years . Many women support and admire my head covering . Some are coming around to it . From a historical perspective , Martin Luther is on record for supporting this . I’ve come to the time of life where it doesn’t bother me anymore , so I am able to cover more freely . God bless all the young ladies who continue this godly , Biblical tradition .